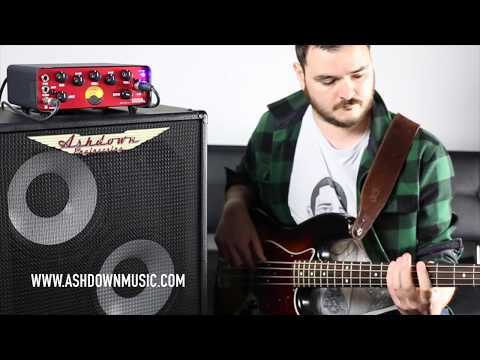 The Ashdown OriginAL C210-300 2 x 10 Bass Guitar Amplifier Combo is the perfect solution for bassists who want a lightweight and easy to transport combo for practise, jamming, gigging and recording. The Ashdown OriginAL C210-300 is equipped with a pair of 10-inch speakers that throw out a mighty 300-Watt output. Whether you're competing with others on stage or tracking in the studio, the OriginAL has enough firepower to get you through. The front panel connections include an instrument input, FX Send/Return, and a DI output. The input is equipped with a passive/active button, which allows the input response to be tailored to cater for active or passive bass guitar pickups. The input level dial gives you further control in dictating the perfect level for you, with Ashdown's proprietary VU meter affording a direct visual guide. The ability to tweak your signal using Ashdown's 5-band EQ adds another layer of control to the C210. There are knobs that can be adjusted to set bass, middle and treble with a lo-mid and hi-mid for deeper signal control. Whether you're looking for a loose and fat or tight and articulate low-end, a bouncing mid-range energy, or greater emphasis on high-end clarity, you have everything you need at your fingertips. The Shape button enhances your tone further, lifting frequencies to offer a brilliant output. The output control dictates the output volume of the amp via the DI output, giving you total mastery over your tone. For those times when you just want to practise in silence without disturbing family, friends, or neighbours, the headphone socket along the rear panel allows you to play into the wee hours without a soul being aware. As we've come to expect from the team at Ashdown, the OriginAL C210-300 is built like a tank, and ready for taking on the road. The hardy enclosure is covered in durable carpet to create a traditional look and feel. The speaker is protected by a heavy-duty steel hexagonal punched grille cover. Along the right side there is a single metal bar handle that allows you to carry the amp with ease. The OriginAL C210-300 features a kick back design, which enables you to utilise one of two possible stage placement options. Whichever one you go with, there are two sets of feet to prevent unwanted slipping or sliding once in position. Ashdown have so much confidence in the rugged resilience of the OriginAL C210-300 2 x 10 Bass Guitar Amplifier Combo, each model is supplied with a 5-year warranty.